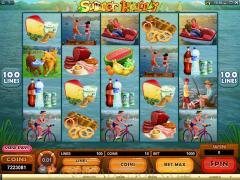 Summer Holiday is a wonderfully summer themed video slot game that was recently launched by Microgaming. This game features 5 Reels and a whopping 100 Pay-lines. This is one of only two slot games in the world that feature 100 pay-lines, making it truly special indeed. The large number of paylines means that the number of chances you have to make a winning combination is largely increased. This large chance of winning has resulted in the game being very popular despite the fact that it is a relatively new game. 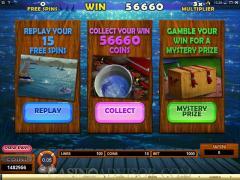 Many casinos that support Microgaming software are now featuring Summer Holiday in their list of online slot games. No bonus round on second screen. The game has a total of 12 symbols that are divided into three groups. These groups are determined according to the kind of payouts that these symbols yield. 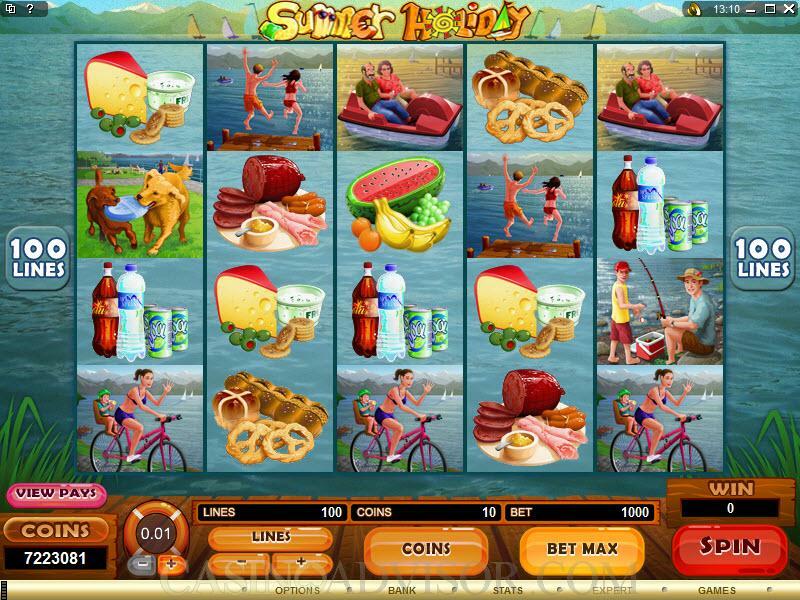 The first group is the Summer Holiday Jackpot symbols, which feature two symbols - the Summer Holiday symbol and the Duck symbol. These two symbols have the highest payouts. The second group of symbols is the Medium payout symbols which consist of five symbols - Boating Couple, Fishing Couple, Girl and baby on cycle, Swimming children and two dogs symbol. The final group of symbols is the low payout symbols. There are five of these symbols as well, and they are - Pretzels, Fruits, Cheese and Crackers, Water and beverages and the Cold Cuts symbols. The coin denomination in this game is not very varied, ranging from $0.01 to $0.05. The maximum bet per pay-line is fixed at one coin per pay-line, making the maximum bet a low $5 per spin. This means that this game is a dedicated low roller game, however the jackpots are massive, and so the potential prize money in this slot game is very high despite the low wagering amount per spin. The duck wild symbol is the one that will win you the most money. 3, 4 or 5 duck symbols in any spin will not only trigger free spins and a 3x multiplier bonus, but it will also complete any winning combination by substituting for the other symbols. 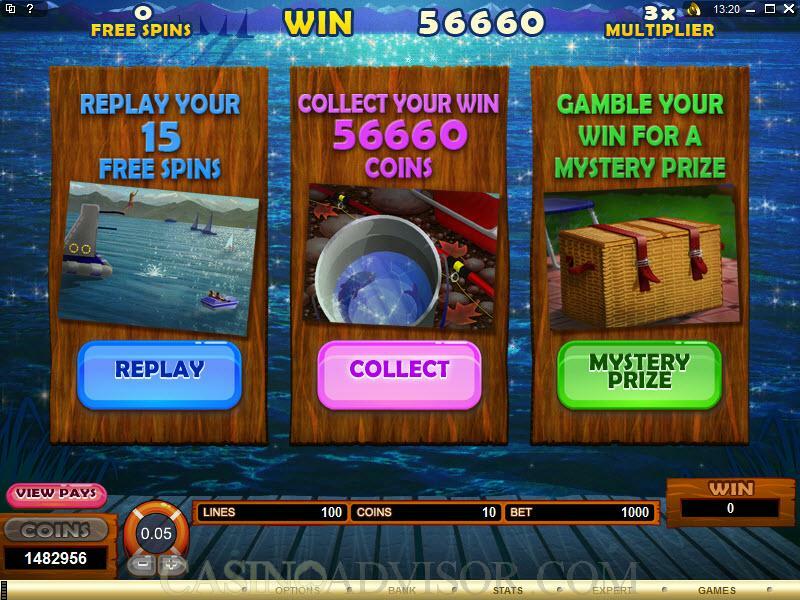 Once you have completed the free spins, you have the option of picking a prize, and could either choose another round of free spins or choose to win a mystery prize, which is a bet multiplier which is anywhere between 10x and 100x. The other special symbol is the Summer Holiday stacked wild symbol which will substitute itself for any symbol to form a winning combination. It helps to complete pay-lines in order to win you more cash. The Summer Holiday symbol could appear on an entire reel, and is a feature of every spin. Interested in reading more detailed information about Summer Holiday? If so Click Here for more details.